Beirut Club (LBL) strengthened their roster with addition of 33-year old American ex-international point guard Justin Dentmon (183-85kg-85, college: Washington). He played recently at KT Sonicboom in South Korean KBL league. In 20 games he recorded very impressive stats: 16.5ppg, 2.9rpg and 2.7apg this season. Dentmon also spent pre-season at Anyang KGC (also in KBL). The other team he played shortly were the Texas Legends in NBA. In 2010 (a year after he left the college) Texas Legends selected him as fourth overall pick in D-League draft. 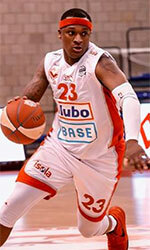 He graduated his college in 2009 andis in his tenth season in pro basketball. Among other achievements Dentmon won Chinese CBA championship title in 2016. He received also Asia-Basket.com All-Chinese CBA Honorable Mention award back in 2016. 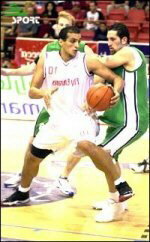 Dentmon represented USA at the Panamerican Games in Guadalajara (Mexico) eight years ago. His team won Bronze and his stats at that event were 5 games: 9.2ppg, Assists-5 (3.2apg), FGP: 50.0%, 3PT: 37.5%, FT: 85.7%. Dentmon is a very experienced player. Thanks to his pro career he managed to play on three different continents (Europe, Asia and of course North America) in nine different countries. Dentmon has played previously professionally in Dominican Rep., Israel, Italy, Lithuania (Zalgiris), Puerto Rico, Turkey (Galatasaray), Venezuela, NBA (San Antonio Spurs and Toronto Raptors) and China (Blue Whales). A very good scoring combo guard, started his first 2 years for U-Washington as a PG with Brandon Roy, and spent his last 2 years at the shooting guard spot. Lighting quick. A prolific scorer who can make a lot of points in short amount of time and "shoot the lights out" even at the elite level. Very handful player with great ball handling skills and control. Has an incredible athleticism for his size. Great shooter from every range. Makes good use of spin dribble and screens to score or kick out. He is very tough, strong and confident, and has no fear at all to face tall defenders although he is small for good and bad. He is a good penetrator and drives both ways although it seems he prefers more to drive to the right always looking for contact. An amazing 1 on 1 player very hard to stop even at the very high level-very creative and versatile. A solid passer (3rd all time assists leader for U-Washington) with good court vision. As for his defense he is a good stealer (2nd all time steals leader for U-Washington) and has very strong legs, quick hands, and quick footwork but it seems that he needs to a little more aggressive or put little more effort to guard NBA players on daily base. His shot selection also can be little better. His brother Bruce Barron committed to Oregon after getting 89 rating from ESPN and being nominated to McDonalds All America.